Sweet Home Collection – 100% Polyester Microfiber Down Alternative Comforter. Add a luxurious comforter that ecompasses all the key factors that one looks for in a comforter: comfortable, breathable, and smooth. Hypoallergenic down comforters provide the warmth and softness of down that minimize the development of allergic reactions. It can make a big difference in sleep comfort and overall allergy levels. Comforter only - Shams not included! Available Sizes: Twin 68" x 88", Full 78" x 88", Queen 88" x 88", King 102" x 88"
Sweet Home Collection – 100% Polyester Microfiber Down Alternative Comforter. Add a luxurious comforter that ecompasses all the key factors that one looks for in a comforter: comfortable, breathable, and smooth.. While also being hypoallergenic, this down alternative comforter provide the warmth and softness of down but minimizes the development of allergic reactions. It can make a big difference in sleep comfort and overall allergy levels. Very soft. Light weight. Good color. The queen size is perfect for my full size bed. Finally, a comforter that actually hangs over the sides properly. And I like the feel of the fabric. I really love this comforter! No matter what the temperature is i have to wrap up in a blanket at night or I just cannot sleep. My old one was way too thick and bulky so I bought this one to try. It is just perfect. It is nice and warm but not so thick or bulky. The material is very soft with rich vivid coloring. It keeps me warm without overheating me. I am very pleased with my purchase. I bought this comforter for my husband because I wanted something warm and lightweight and was very pleased with my purchase. I also was very pleased that delivery was very quick. Thank you Walmart for the speedy delivery. I bought this comforter for my husband, who really needed it. He has been sleeping in this single sleeping bag for about a month, don't get me wrong "he" loves it. He has been saying that is all he needed and i disagreed so i bought this comforter and he adores it. The down alternative polyester box stitch microfiber comforter is light weight and keeps him very warm and cozy. The feel of this wonderful comforter is a soft silky feel and it is super warm. The microfiber material makes this an extremely soft comforter and is very easy to maintain and keep clean. Thank you for a wonderful comforter that makes for a good and snuggly blanket. It doesn't matter how old my son gets, he loves to snuggle up in a soft blanket. I ordered this in Grey for him, since he is 22 now. The microfiber is great for him. It washes easily, and the grey is a really nice color. It's as nice as the photo shows. We picked up in the store, and it was in perfect condition. It had no odd odor to it, and no imperfections. It is very soft and fluffy as well. It rings true to the Queen sizes we have had in the past, too. The box stitch design is a classic, and looks very nice. The stitching was done tight and on point as well. 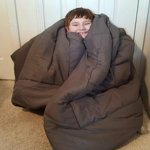 My younger son really enjoyed snuggling with this comforter, and I actually had a hard time getting it from him to give to my older son. It is that soft and comfortable. It's a moderate weight comforter. We have no complaints. I received this at a discount. I was under no obligation to leave my honest and unbiased and review. This down alternative comforter looks great on my bed and I love the look of the fabric. However, it is not nearly as fluffy or as soft as I would have liked it to be. I thought it would be similar to a fluffy down. It was still a good purchase and it gives my bed a refreshing look, but buy it for function and not for any added comfort. the comforter is absolutely perfect...so soft and nice and warm..live in NH so it gets cold...lol..but plz read any and all descriptions before purchasing...with this item the picture makes it look like you get a comforter and 2 pillow cases, and I bought this for that reason but when I got it home It was only the comforter on the package, no pillow cases, so I went back and checked the site, and sure enough had I read the description I would have seen it does NOT come with anything else... this comforter is deff worth the price...it is very very nice...nice tight stitching and everything...a must buy!! WARNING - NOT LIGHT BLUE! Color is a pretty big deal for a comforter - matching your rooms, etc. On this item, both the manufacturer website and Walmart's offer a "light blue" and they display a light blue comforter. What was sent was AQUA, it said "Aqua" on the packaging, and the picture on the packaging was Aqua, and the wording of the title of this particular comforter packaging was different. This Aqua is almost a sea foam pale green - definitely not a light blue. The manufacturer said the two colors are interchangeable on their end - and they were sorry if I just didn't like the color. I'm sorry, but LIGHT BLUE IS NOT AQUA! Walmart would, of course, take it back because they are wonderful, but this was a gift that was needed right now so I'm not sure what I'll do. Just beware - it is not the pretty light blue pictured. It's more of a pale green. If both "light blue" and "Aqua" were options I could understand this to be a "poor pick," but in fact they just call the color whatever they feel like calling it. The picture on the one I got does NOT have that big trim along the bottom where there are no squares, so the design may be different as well - I don't know because I can't unfold it - being a gift. I spent days searching for a "light blue" - this gift is now ruined. does shams come with this comforter? 2. Yes, the comforter does include decorative shams. When you wash the blanket, do the insides bunch up into a ball?